I came across the Greyhound track advert in the Friday 7th October 1932 addition of the Laindon Recorder several years ago but until recently have not been able to find anybody who can remember anything but it.Then in searching through the council archives recently I came across a number of audio tapes taken in the mid 1980s of people’s memories of Basildon . One of the recordings was of Ron Moorcroft memories. Ron other than owning a couple of shops in Laindon was also later in life the warden of the first Laindon Community centre. He tells us that the greyhound track was in Tavistock Road at the top of Nichol Road that ran off the East side of the High Road. The site is possibly where Mill House School playing field is today. He also informs us that in the middle of the track was a football pitch. 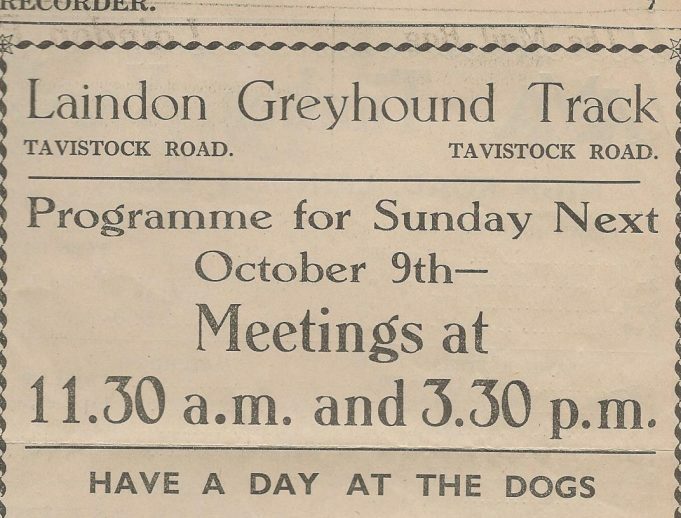 What I found rather surprising was that the meeting was to be held on a Sunday.The only other information I have gleaned from somewhere is that the greyhound track was really a training ground but a few races were held.If there is anybody out there who has distant memories of this greyhound track, please add your comments. Editor: Nina Humphrey has asked me to add the following maps to this article. Click on the images to see a larger version. Firstly, I can confirm Ashleaves Avenue did exist, I used to live at no 24 with my mum, dad and my two brothers, 1957- 1965 I used to go to Laindon Park School, we had two wells in the garden, which were found by the school caretaker, at the school in Tavistock Road. I’ve managed to find a little more information. Casa Blanca was to the north of Tavistock Road, on the east side just before the road turns westward to join the High Road, almost opposite Archer Road. 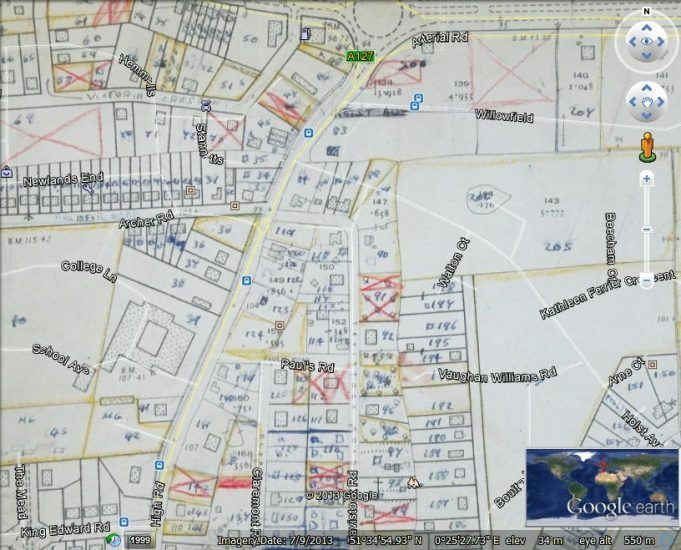 On the 1949 survey map shown above, Casablanca is number 90. The area where Casa Blanca had once been is roughly where numbers 15, 17 and 19 Tavistock Road now stand. Casablanca changed hands over the years. The Lucas family lived there from around 1918 until the 30s/40s. In 1949 – Mr and Mrs Edwards lived there. In the early fifties, Carnival Queen entrant Miss Joan Hutton lived there with her parents and in the late fifties, Mr and Mrs Quinton were in residence.The field behind Casablanca was rectangular and its original boundaries now roughly encompass Holst Ave, Walton Court and Beecham Court. The map also shows the pond that Rob mentioned. A second field lay to the east. This is where the Paddocks is now situated. Hallo Rob, I am deeply sorry to read of the passing of Freddie, he will be well remembered by the Laindon youth of the immediate post war era. Another of my memories you have verified from the conversations with your grandfather was that the ”hare” used for greyhound racing was pulled at the end of a rope in a straight line, as stated in my first comment on the subject. Yes hello Bill, Dad was born in August 1924 but sadly passed away in 2003 shortly after my mum Barbara (a Laindon post office girl). He used to tell me stories about the field out the back of Casablanca with the dog track and the pond and the market. The first time my dad said the “F” word in the house whilst playing chequers with my aunt, which he’d learnt from a gypsy boy staying on the field, my grandad took him out the back & horsewhipped him across the backside. To this day, none of us 3 sons swear in our homes. My Grandfather was Frederick A. Lucas buried at St Nicholas 1935. Born 1870. I do have a picture of my Dad Fred (the accordion) and Freda Lucas outside Casablanca and several other local photos and memorabilia. He owned many plots in the district on the Great Cowles estate, noak bridge & b&q sites. I have records & maps but he died intestate. Most were sold off to support the family until my grandmother died in 1938. As orphans my aunt became housekeeper for Joe Rummins at Butlers Grove then went on to be a nurse at Orsett hospital. My dad worked as an apprentice at S X Tools during the war. He served in the Local Home Guard. I would be happy to share the 100 + years of local knowledge and topical photographs that I have relative to the Lucas Family in Laindon with you all. The Ironic point is that my grandads solicitor was Colemans who are advertised in the window of Rawleys in a Laindon pic. I was born in 65 and grew up in one of the last houses built by Rawleys in Worthing Road in the 60s & 70s. 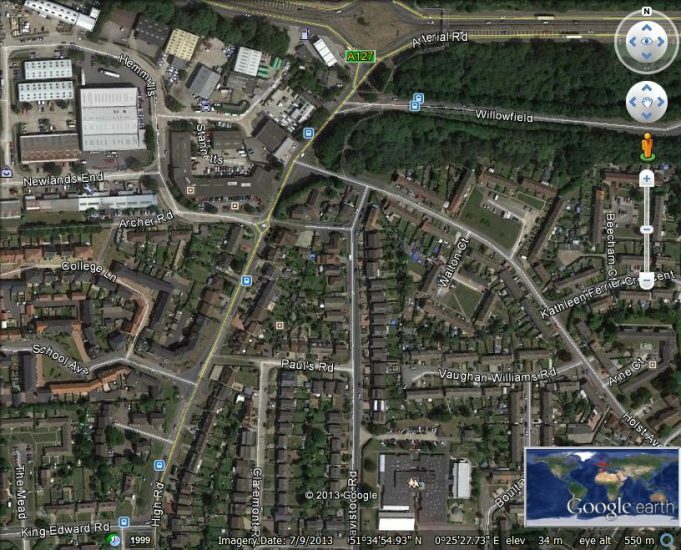 A much different world – Laindon – then & now. Hallo Rob, I knew your father, Freddie and his accordion playing quite well and he often played at the Prince of Wales before the Lionel Hyatt era. He was slightly younger than me, but if still alive would be in his early nineties. Yet another memory restored. What is the world coming to? Dog racing (and gambling) on a Sunday? In 1932? Where was the Lord’s Day Observance Society? Thank you for the little extra information. The jigsaw is gradually being competed. What was your grandfathers name though and if you have anyother snippets please let us know. Is there any chance you have any photographs of the track or Tavistock Road. I am sure Nina will try and locate ‘Casablanca’ for us. There was a greyhound track, it was owned by my Grandfather who lived in a house called Casablanca in Tavistock Road. He died in 1935. It was a straight track on the Mill House school site. My dad used to tell me Gypsies also stayed on the field from time to time and the circus visited too. There is certainlly a mass of conjecture as to the location and the formation of the track which differs widely in the minds of local people. Richard quotes it as being a stadium yet to my mind it was only a field. I feel there is little doubt that the designated entrance was in Taviustock Road as was that of the Victoria Sports Club. It certainly from my own experience could be accessed from the Arterial Road across fields and Richard and Barry both suggest it could also be accessed from the Basildon Drive area which is consistent with my own memory that it was to the northern end of Tavistock Road although I have never entered from that area. However I do not remember a circular or oval track with a football field in the middle. I suggest this would have been impossible at that time as such a track would require to have a steel running rail completely around it for the hare. This would be a permanent fixture, also requiring a supply of electricity to power the hare and I find it hard to believe such a supply was available in Tavistock Road in 1932. To make a comparison to the Romford Stadium would to my mind be equal to comparing the Memorial Hall to the Hammersmith Palais. Laindon also had grass track racing opposite the Summerhill garage on the Arterial Road but could not be compared to West Ham or Hackney Wick speedways. Much of the sport and pastimes of old Laindon were carried out on improvised locations and I have lost count of the hours I spent in the preparation of cricket pitches . Thank you Nina for confirming the existence of Ashleaves Avenue and one small point which may be coincidence is that one property was named Victoria which was also the name of the football club which played on the ground in question. I wonder if there was any connection with the property or occupants when the club was named. The residents of Ashleaves Avenue in 1929 were:- ‘Victoria’ – John Littler. ‘Oakdene’ – Alice and William Collier. ‘Lavinia’ – Annie and Ernest Fullalove. 4 Ashleaves Avenue – Maud Greed. ‘Estella’ – Minnie and Richard Parker. ‘The Clover’ – Jane and Thomas Price. Ashleaves Avenue was there all the time I lived in Laindon from August 1957 through to August 1963. I could walk up Nichol Road, cut through ‘The Cot’ and through the allotments in Ashleaves Avenue to reach Basildon Drive and my girlfriend’s house in Kathleen Ferrier Crescent in about five minutes. I was quite often told off by one elderly resident who lived in the last house in Ashleaves who probably thought I was intruding on his vegetable plot, this was the last thing on my mind at the time. I doubt if any football clubs were named after the house called Victoria or whether the greyhound track was anywhere at all in this vicinity. Referring above to Bill Diment’s comments on the size of greyhound tracks I can only recommend he looks at Romford Stadium which has a huge central area large enough for football to be played on it. Looking at Nina’s evidence Ashleaves Avenue was there in 1929 which predates the 1932 quoted for the greyhound stadium. My guess then is that the stadium was near to the Arterial Road perhaps near the fields at the back of Kathleen Ferrier Crescent where I spent many happy summer hours back in the day. Lets hope more comes to light on this fascinating subject. Responding to Barry Ellerby, while Iam sure the designated entrance was from Tavistock Rd. as this would have been the only entrance served by a road, it is quite possible for the track to have been accessed from Basildon Drive and I don’t know if the mapped Ashleaves Avenue really existed and of course we are not talking about a totally fenced off ground. Also re-reading the comment of Ron Moorcroft I believe he does not actually say the ground was in near proximity to Nicoll Rd, but that it was in Tavistock Rd. at the top of Nicoll Rd. as a route guidance for the greater population of Laindon who lived south of the High Rd.school This type of factually incorrect information in respect of location , but which serves to guide people to a given area is not unknown, as I have an advert from the Laindon Recorder of the middle thirties in respect of the Basildon Country Club which it is stated to be facing School Lane, which it never was but further down the Basildon Rd., which is not mentioned in the advert and actually faced the bungalows of the Perfect, Bugg and Stocker families. Unless some documentary evidence comes to light, I fear we will never resolve the inconsistences existing in the memories of old people. Ashleaves Avenue definitely existed. On the 1929 Electoral Register, the follow dwellings are listed: – ‘Oakdene’, ‘Lavinia’, ‘Victoria’, ‘Estella’ and ‘The Clover’. The 1949 Electoral Register shows 36 people living in Ashleaves Avenue, aged 21 and over of course. I believe the avenue disappeared in the early fifties when the Pound Lane estate was developed. Further to the comments of Richard, it may be how the individual memories are worded that lead to confusion. The only times I visited the site was across the fields from the Arterial Rd. from a point where there was a small wooden hut on the south side which served teas and light refreshments , this took one to the north east of the ground, but as I never went into Tavistock Rd. and did not know how close the official entrance was to Nicoll Rd. 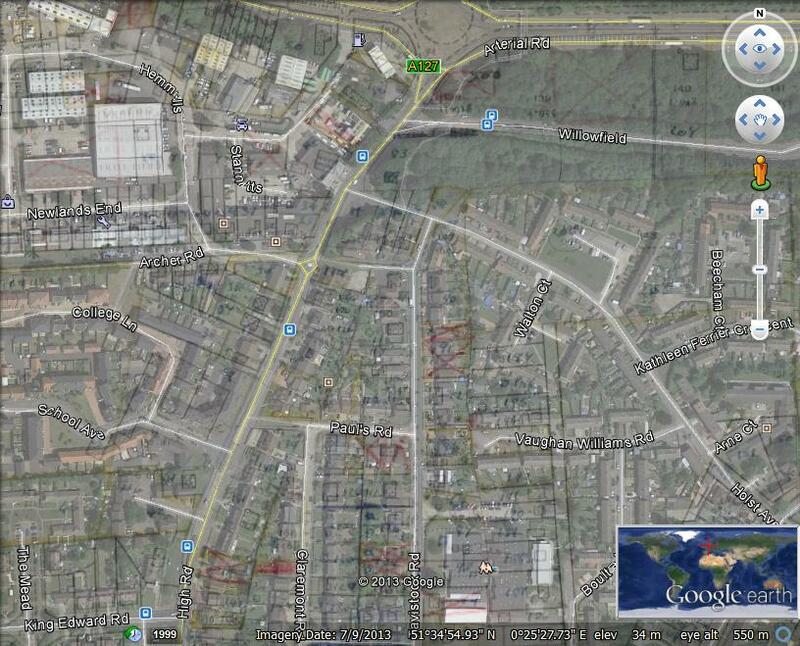 In fact the area between Basildon Drive and the High Rd. was unknown country to me. Mr.Moorcroft’s memory of a track with a football pitch in the middle is not how I remember it as it conveys an impression of a circular or oval track which would need a mechanically propelled hare on a steel rail and possibly automatic release traps . In any case, while I have no expert knowledge of greyhound tracks I do not believe any are large enough to have a football pitch in the middle. My memory is of a hare on a rope traveling in a straight line and at the start the dogs being held by their owners and released once the hare started. There suggestion that these meetings may have in fact been practice could have been a combination of the two with a work out for the dogs and a little entertainment for the public but as far as I knew, there was no legal facilities for the odd wager, unlike the Dunton point to point meetings. It is strange that while there are masses of photographs of old Laindon, as not one has come to light showing this ground. 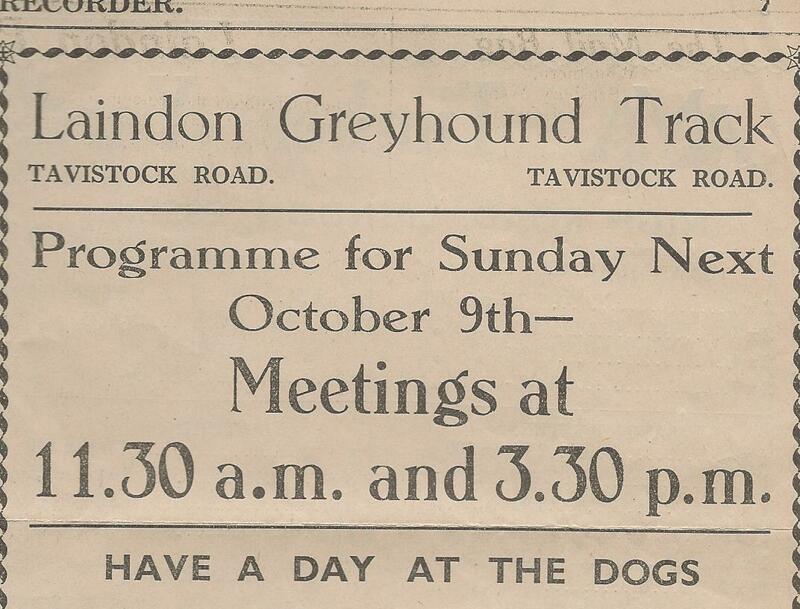 In her article “A Short History of Laindon”, Alice Jackson also makes a brief mention of a Greyhound Track in Laindon. I am only making a suggestion about the whereabouts of the entrance to the dog track. Could it have been from Basildon Drive. There was open space between the northernmost end of Tavistock Rd. and the Arterial Rd. in which the Victoria Sports Ground and the greyhound track were located. Although not actually in Tavistock Rd. this was the only means of access unless one climbed over the fence opposite the Fortune of War and walked accross the fields. The name chosen for the football club seems strange as Victoria drive was to the west of the High Rd. Wow this topic of the greyhound track is really interesting. Firstly, if the track was only a training ground then why does the advert say ‘Meetings’ and ‘have a day at the dogs’ ? Bill Diment now places the access point in the north of Tavistock Road, near the Arterial and not near Nichol Road at all. Finally they must have been criticised at the time, having race meetings on a Sunday but I suppose anything is possible, Laindon is such a fascinating place and its relatively short local history is very colourful. I am at a loss to place where this greyhound track could have been. The description above says at the top of Nichol Road. When I lived in Nichol Road, admittedly 25 years after 1932, there was clear evidence of a former property at the top, in Tavistock Road. This property had long gone but the deep circular brick well in the garden and the trees planted neatly were the remains of what people called The Cot. This property is on all the prewar OS maps. There were also other properties still remaining close by, thus ruling out any football pitch sized areas. So, over to Bill Dement, where was this hare course and football stadium, this is a real mystery? Yes there was a greyhound track in Tavistock Rd., but was not similar to most peoples memories of an oval track, but chasing a “hare” across a field on the end of a rope which was attached to a rotary drum. There was football pitch which was the home ground of the Victoria Sports Club and was one of the more prominent teams at the time.